This one is DEFINITELY going on the regular rotation at our house. Do you see this deliciousness? 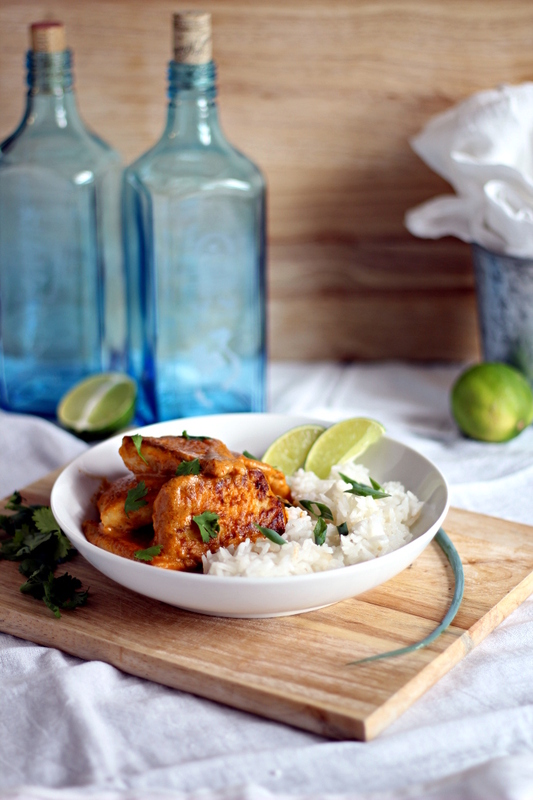 Crispy fried tilapia with a sweet and spicy coconut-curry sauce on a bed of fluffy jasmine rice. Have I already told you about my tilapia obsession? I haven’t? It’s quick to thaw, and quick to cook! *Technically* I don’t think the food-governing-lords recommend thawing fish any other way than overnight in a fridge (seriously, who has the foresight for that? ), but I like to just toss mine in the sink, cover it in room temperature water, and let the magic happen. I’ve been using this method for years and have never had any issues. It thaws in about 5-10 minutes, which means I can have absolutely NOTHING planned for dinner, then 10 minutes later I am cooking away. Which brings us to today’s special presentation of Crispy Tilapia in Curry Sauce. This meal rocks my world in so many ways. Let’s make another list, shall we? Every ingredient comes from either the freezer or the pantry. Which means I can put absolutely no forethought into making it. <— This is KEY. Pat each of the fish fillets dry with a paper towel, then cut into quarters. Stir together the flour and pepper in a pie plate or shallow dish. Place the fish pieces into the pie plate a few at a time and coat them with the flour mixture. Shake off any excess flour and set aside. Heat the wok or vegetable oil in a large skillet over medium-high heat. Once hot, lay half of the fish pieces to the pan in a single layer. Cook for 1-2 minutes per side, until crisp and brown. The fish doesn’t need to be cooked all the way through at this point because it is going to simmer later on. Once crisp, remove from pan and set aside. Repeat this process with the remaining half of the fish pieces. 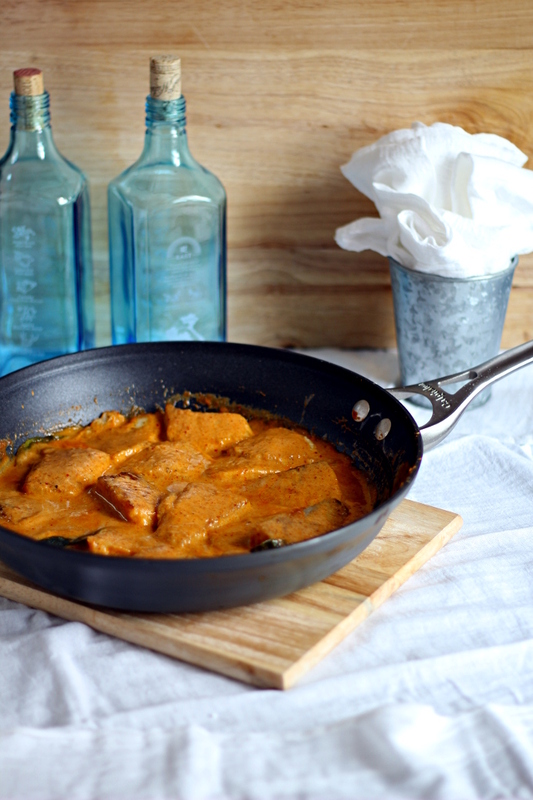 Reduce the heat to medium and wipe out any excess oil in the pan, then add half a can of coconut milk. Cook, stirring occasionally, until the coconut milk is hot and foamy. Add in the curry paste and stir for about 2 minutes to work it into the coconut milk, using the back of a wooden spoon to break up any large pieces. Add the rest of the coconut milk, as well as the water, sugar, fish sauce, and lime leaves (if using). Stir for one minute, then return the fish pieces to the pan. Spoon the curry sauce over the top of the fish. Reduce the heat to low and let simmer for 10-12 minutes, or until fish has cooked through. Discard lime leaves. Garnish with cilantro, and serve on a bed of jasmine rice with lime wedges for squeezing. Well that just looks absolutely fabulous! This looks great (as do a hundred other of your recipes!) Looking forward to making this for the husband. This looks so amazing!! I really want to make this but I don't have access to kaffir lime leaves where I live. Is there a good substitute for this ingredient, or will the dish still taste just as good without the lime leaves? How did you get the curry all red like that? I'm a student and I tried this recipe. It came out well but I think it could have been better for me. It was my first attempt but I will try it again and again until I perfect it. :) Thank you! Hi Karan! I used Thai Kitchen Red Curry Paste. What kind did you use? This recipe is amazing. I've never actually had curry, so this was kind of jumping into a cuisine I know nothing about. I couldn't find the lime leaf (boo, local stores), but squeezed some lime juice over my dish and it seemed to work okay. When I tried the sauce plain, I was concerned it'd be too sweet, but the moment I tried it with the tilapia, it melted in my mouth. I should note that the only seafood I eat is tilapia and salmon, so I'm SO happy I found this recipe to add to our mix.So wonderfully delicious. Thank you so much! Hi Kirs! Thank you so much for this wonderful feedback. 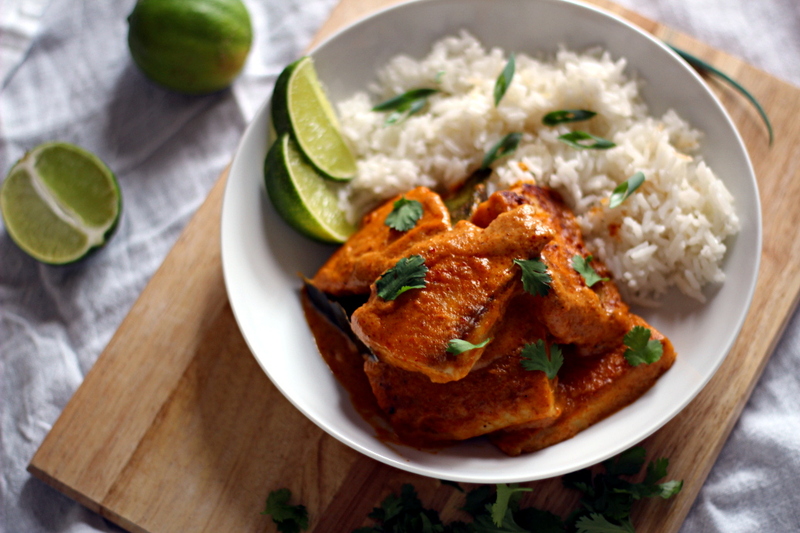 I'm super picky about seafood, too :) I'm glad you introduced some curry into your life, it's a favorite of mine because it's so easy to whip up at a moment's notice. Thanks again for stopping by! Made this recipe tonight. Delicious. Didn't have lines but I added red pepper flakes to increase the heat. Thanks. This was SO good and so simple too! Thanks for sharing, I will definitely be making this again and soon!